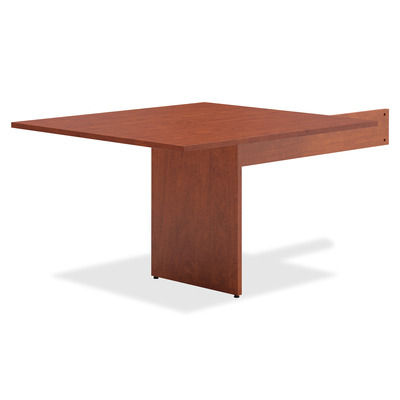 BSXBLMTO48RA1A1 : HON® Basyx By Hon Bl Tables Medium Cherry Laminate Component - Laminated Rectangle Top - Slab Base - 44"
Basyx By Hon Bl Tables Medium Cherry Laminate Component - Laminated Rectangle Top - Slab Base - 44"
Table end piece is part of basyx by HON BL Modular Tables that allow you to add sections as needs change. This flexible, rectangular design is both practical and stylish for maximum comfort, support and functionality. Heavy-duty, 1" laminate top and slab bases provide a solid, sturdy foundation. Easy-to-clean, Medium Cherry laminate is scratch-resistant, spill-resistant and stain-resistant. Steel understructure offers additional tabletop support. Slab base is reinforced with double stretcher rails and steel tubular support. Adjustable leveling guides assure proper installation and maintenance even on uneven floors.